COCOA BEACH, Florida - A great white shark weighing over 2,000 pounds that was tagged with a radio transponder to be tracked by satellite has had its latest ping locations off the coast of Brevard County, Florida on January 24, 2017. The 14-foot great white shark, named Katharine, that was tagged off Cape Cod in 2013, has steadily been making her way northward along Florida's coast. Katharine has remained just off the Florida coast the last few weeks, making her way from West Palm Beach, Florida northward to Florida's Space Coast. 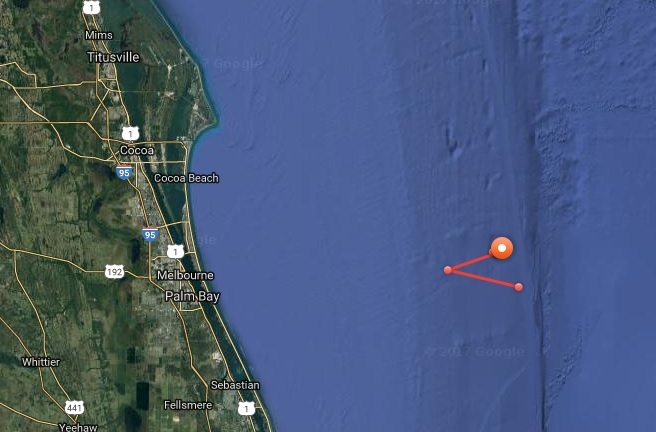 The great white shark made her closest approach to Brevard County in May 2014 when she was tracked just 1 mile away from the mouth of Sebastian Inlet. According to NOAA fisheries, female great white sharks are believed to be mature when they are about 13-14 feet and can reach sizes up to about 21 feet in length. Great white sharks can be found off the Atlantic coast of the United States from as far north as Newfoundland, Canada, to as far south as the east coast of Florida - but rarely go into the Gulf of Mexico. To follow the Katharine's latest location, visit the Ocearch tracking map.